Some scholars maintain that in developed democracies, legal citizenship is losing its salience, as such democracies tend to grant most human rights to everyone resident in their territories, even including undocumented (‘illegal”) migrants. Kristy Belton disputes this contention. She argues that even if migrants are afforded human rights in some democracies, this privilege does not extend to the stateless. 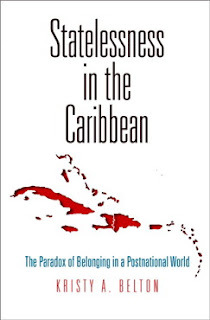 You can find this argument in her 2017 book, Statelessness in the Caribbean: The Paradox of Belonging in a Postnational World, published by University of Pennsylvania Press. Belton argues that statelessness in the 21st century is very different from the statelessness that Hannah Arendt analyzed in her Origins of Totalitarianism. Arendt wrote about stateless migrants, wandering the world to find a place that would take them in after their own countries expelled them or forced them to flee. By contrast, Belton argues, in the 21st century many people are rendered stateless in situ, in the place where they are born. Belton’s evidence for this contention is drawn from her case studies of the Bahamas and the Dominican Republic. Both are democracies, and both have significant minority populations of people of Haitian descent. Drawing on her own interviews with local officials, NGO actors, stateless individuals and others, as well as upon interviews conducted by other individuals and organizations, Belton paints a picture of people living in limbo or liminality, part of the society but not formally members of the polity, in effect “noncitizen insiders”(p. 10). Technically eligible for Haitian citizenship, they are stateless de facto, as they are often not aware of their eligibility and in any case, do not wish to be considered Haitian. These individuals are not wandering stateless migrants: they were born in the Bahamas or the Dominican Republic but are not entitled to citizenship in those two countries, at least not at birth. In the Bahamas, they have a narrow one-year window at the age of eighteen to apply for citizenship. During this period they are often rendered de jure stateless for a few months, as they are obliged to renounce their nominal Haitian citizenship before being registered as Bahamian citizens. In the Dominican Republic, things are much worse. Not only may people of Haitian descent not obtain citizenship at birth, but a law passed in 2010 retroactively deprives hundreds of thousands of citizenship. Only those of Haitian descent who can prove they are descended from individuals born in the Dominican Republic before 1929; that is, four generations ago, are now entitled to citizenship. Bureaucratic inertia and deliberate obfuscation of the seemingly non-discriminatory rules surrounding citizenship compound the disadvantages imposed on people of Haitian descent by these laws. Often individuals born in the Dominican Republic do not know that they are actually considered to be citizens of Haiti, nor do they know how to go about obtaining confirmation of that citizenship. When persons of Haitain descent turn 18 in the Bahamas, they may not know of the one-year window available to apply for registration as citizens. They may also be denied the documents, such as birth registration, needed to make their applications. Some are also victims of gender-biased policies that grant citizenship to children of citizen fathers born abroad, but not to mothers in the same circumstances. Belton argues that they should have the right to know about citizenship rules, and be ensured the right to judicial review of sometimes arbitrary decisions about their citizenship. The quasi-stateless individuals of Haitian descent are often victims of racism, enduring discrimination in employment, housing and education. In the Dominican Republic, people identify themselves as white or “Indio” and look down on black people of Haitian descent. In both countries they are considered impure, equated with dirt and criminality. Belton quotes heartbreaking stories from her informants of deplorable living conditions, racist school bullying, and opportunities denied. Technically speaking, many of the “stateless” individuals of Haitian descent in the Bahamas and the Dominican Republic are not stateless; if they knew how to go about it, they could claim Haitian citizenship. But that is not the citizenship they want. They want to be citizens of the countries where they were born and raised, where they attended school, where their families are. They want to realize their ambitions, to get an education and a job and start a family, in the country to which they are attached. Without legal citizenship, these de facto stateless individuals cannot realize their life projects. Bahamian-born minors of Haitian descent possess identity documents, but cannot use them for travel; thus young people are unable to compete in international sports competitions or accept scholarships to study abroad. Persons of Haitian descent in both countries are at high risk of illiteracy, undermining their capacity to understand the procedures and documents necessary for them to obtain citizenship. They are ghost people, un-noticed and uncared for, denied social membership in the places of their birth and personal identification. Belton closes her book with an eloquent plea for citizenship to be considered an aspect of global distributive justice which, she argues, should not be confined to material goods. It should encompass citizenship, necessary in order to enjoy all other human rights. Citizenship is also necessary to the right to belong, to feel oneself part of the community in which one has grown up, and part of the territory to which one is attached. Everyone, contends Belton, should have the right to citizenship in the place of one’s birth. In making this argument she draws upon ideas of social membership and sense of place. In the light of her two case studies, this assertion makes sense. But it might not make sense for the many people who are victims of prior forced displacement or who are born in countries of which they would rather not be citizens. The next step, then, is a right to migrate. But such a right would upset completely the sovereign prerogative of all states to decide who should be its members, regardless of the criteria they use. Belton’s arguments are sophisticated and theoretically rich, and her compassion for the subjects of her research suffuses her analysis. This is an excellent study of what might be considered the “forgotten” stateless, people who are not members of stateless groups such as the Rohingya of Myanmar, but are rather individuals forced into social liminality and legal insecurity by borders, immigration laws, and racism. Note: I wrote this review for Human Rights Quarterly, whose editor, Bert Lockwood, kindly agreed to let me post irt on my blog as well.